Samford University's McWhorter School of Pharmacy has received a $385,000 gift from Cardinal Health, Inc., of Dublin, Ohio, to fund scholarships for senior pharmacy students preparing to serve in independent pharmacies. This is the fourth gift from Cardinal Health for this purpose. 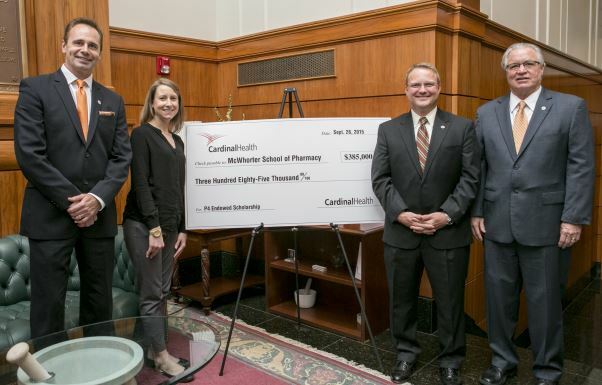 In 2012, Cardinal Health established the Cardinal Health Annual Independent Pharmacy Scholarship in McWhorter School of Pharmacy as a part of their organizational commitment to supporting the growth of independent pharmacy. Cardinal Health has contributed $865,000 to their Samford scholarship fund since its inception and the fund is fully endowed. Nationwide, only ten schools were selected to receive support from Cardinal Health’s Pharmacy Scholarship Program in 2015. According to Cardinal Health, schools are chosen based on their commitment to advancing the independent pharmacy profession. These schools offer curricula focused on operating an independent pharmacy; support student-run chapters of the National Community Pharmacists Association (NCPA); endorse internship and co-op programs with local independent retail pharmacies; and demonstrate high post-graduate placement rates in community pharmacy settings. "We understand the impact independent pharmacists have on their communities, and the significant role they play in providing cost-effective care that improves patients' health," said Jon Giacomin, chief executive officer of Cardinal Health's Pharmaceutical segment. "Supporting future community pharmacy leaders through this scholarship program is an honor, and we continue to be inspired by the next generation of innovative, patient-focused pharmacy owners as they begin serving their communities." Cardinal Health has donated more than $5 million to more than 28 universities through this program since its launch in June 2011. Cardinal Health, Inc., is a Fortune 500 health care services company that specializes in distribution of pharmaceuticals and medical products, serving more than 100,000 locations.